Imagine if your next vacation could be practically anywhere around the world, and you could alternate homes PLUS you could travel whenever you wanted? Seems too good to be true, right? Try your hand at timeshares and you’ll see there is in fact truth in that first statement and maybe it’s not too good to be true after all. Timeshares, a concept I once thought extremely outdated, is not in fact so. While not for everyone, timeshares are certainly for a lot of people. I’ve seen it with my own eyes. Those who love to travel, enjoy generational fun, those who vacation frequently or those who want to feel at home while on vacation, even if that means a different spot every time. Timeshares are back on the rise, and for good reason. From what I can see, timeshares allow for discerning travelers with high quality taste to get an enjoyable and relaxing vacation while catering to the entire family – whether that includes your toddlers, your Great Aunt Frannie, or that sister in law that continues to nag you. They’re also a great option for your next girlfriend getaway! When thinking back to the “buzz” I’d heard about timeshares in the past, I’ll admit, it was anything but endearing. Somewhere along the line, thanks in part to some bad deals, timeshares got a bad rap. Like many businesses and industries, you have to work tirelessly to overcome such bad publicity and negative associations. And that’s exactly what Occidental Vacation Club (OVC) did. Meet Occidental Vacation Club, a division of Occidental Hotels & Resorts a Spanish chain who have made it their business for over 30 years to thoroughly understand the travel and hospitality patterns of Latin Americans and recreate the world of timeshares. 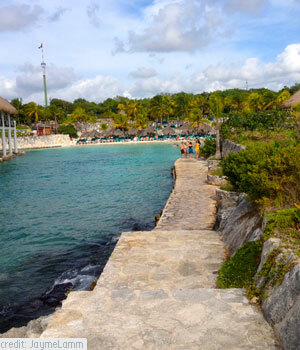 Last month, I had the pleasure of visiting the Occidental Grand Xcaret, an all-inclusive resort in Rivieria Maya located less than an hour south of Cancun and just a few minutes from Playa del Carmen. The property, which consists of 11 International restaurants, 14 bars, 769 gloriously designed rooms and even boasted the remains of an old Mayan Village on-site for touring and additional cultural exposure. Not only was everything included on site, we’re talking activities, food and DRINKS, the service was paramount and the staff made it their job to remember your name, not to mention your favorite drink. Occidental Grand Xcaret still had the relaxing vibe you’d expect while visiting any resort in Mexico and not the salesy and pushiness you’ve come to expect from the timeshare folks you’ve previously been warned about. There are pools and daiquiris and tequila shots and food 24/7 and smiling faces all around you – this was vacation. The resorts are part of a Vacation Club which offers exclusive features and amenities to its members, although it is also open to the public for all-inclusive vacations as well. The club has resorts located in Aruba, Costa Rica, The Dominican Republic, and Mexico (11 all-inclusive resorts in total) with more than 23,000 members. Occidental Vacation Club has three levels of membership/service: Prestige, First Club and Grand Level, and like most things in life, while there is a price tag on membership, there are also beaucoup benefits waiting to be reaped. For information on rates and specials, as well as vacation club membership, go to: www.occidentalvacationclub.com. Perhaps it was just the ambiance and well-appointed leadership behind the Occidental Grand Xcaret during my visit, but after this pleasant and much-needed vacation, I now look at timeshares in a new light. Everyone deserves a second chance, right? We had a great time playing and working out together in Mexico. 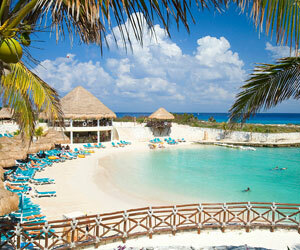 This story tells most of it but not all…check out http://www.occidentalvacationclub.com for lots more info! It looks beautiful… What a great way to vacation! A GREAT COMPANY THROUGH AND THROUGH. A PRIVELEGE TO BE PART OF THE AMAZING OCCIDENTAL VACATION CLUB TEAM. Sign me up for a timeshare right now! The OVC looks like the ideal vacation spot and I would do anything to escape the cold and be on those beaches right now! I’ve been down to mexico many times and it is always such paradise and fun time! Great post. I’m going to check it out. We stay in timeshares in the US quite a bit and find it really convenient because you are basically living in a condo with a full kitchen/laundry etc. for a week. I think the bad rap came from the way they sell them – the pushy sales pitch where they keep you for hours etc. I’ve never stayed at OVC and it looks amazing…I’ll have to check it out. Thanks!